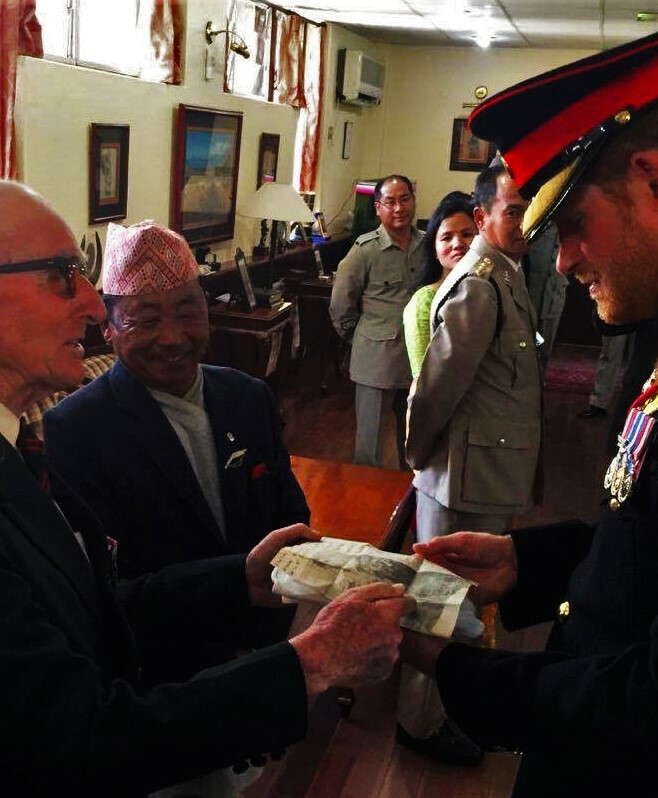 During HRH Prince Harry’s recent visit to Nepal, he had the fortune to meet one of the most famous officers in the history of the Brigade of Gurkhas, Lt Colonel (Retd) John Cross OBE. This was not the first time Colonel John has met British Royalty in Nepal. 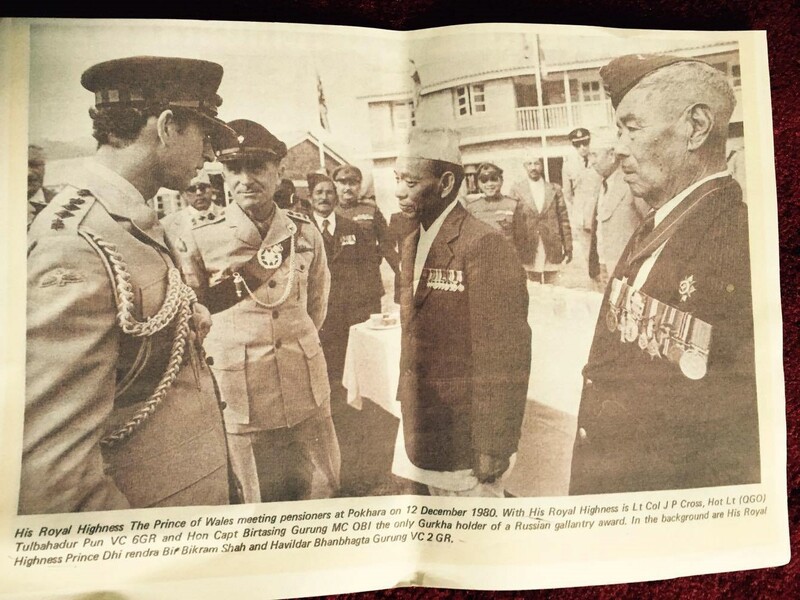 36 years ago, in 1980, Colonel John was Officer Commanding, British Gurkhas Pokhara when Prince Harry’s father, HRH The Prince of Wales visited. At the time, Colonel John was accompanied by two Victoria Cross winners, Hon Lt (QGO) Tulbahadur Pun VC 6GR and Havildar Bhanbhagta Gurung VC 2 GR. Colonel John amusingly recalls that whilst HRH The Prince of Wales shook hands with the VC winners and many other Gurkhas, he put his hand out to shake one man’s hand who did not respond. “What was your Regiment?” The Prince asked, “I was not a soldier,” replied the man, not knowing that an outstretched hand was meant to be shaken. ‘Why have you come here?’ asked The Prince. “Because you’re here. Four days down, one day here and four days back.” (It took four days for the man to walk down from his village in the Himalayas). As it happened, the man wasn’t even a Gurkha, he had come all this way just to satisfy his curiosity and see The Prince! 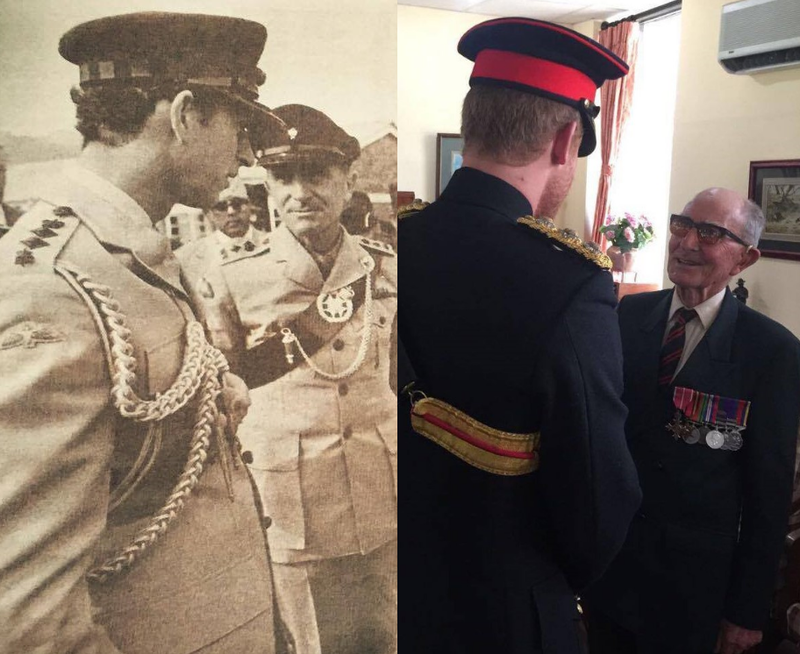 Colonel John shared this story and others with Prince Harry during last month’s visit and presented Prince Harry with a Daily Telegraph cutting of 12 December 1980 with the photo of Colonel John with HRH The Prince of Wales. Colonel John is a legend in Gurkha history and almost every retired Gurkha and serving Gurkha will know of him. He still briefs the young recruits selected into the Brigade of Gurkhas to this day, at the age of 91. Colonel John was born an Englishman in 1925 and is now a Nepali. He served a total of 39 years in the Army and spent 36 of those serving in the Gurkhas. He served in WW2 in Burma against the Japanese and in one action commanded a battalion of surrendered Japanese troops against the Vietminh. The defeated Vietnamese Commanding Officer personally surrendered his 300-year-old sword to Colonel John. Colonel John served in Malayan Emergency and the Borneo Confrontation and spent a total of 10 years service deep under the jungle canopy. He was in charge of Gurkha recruitment for many years in Nepal, which is where he now resides and he was granted Nepali citizenship in 2014. He is also the author of many publications on Nepalese and Gurkha history.